As the Federal Funds rate increases, investors and the Fed expect a proportional move in the 10-Year U.S. Treasury yield. Is that expectation reasonable? History says, “no.” Using such expectations for investing is risky. The linkage is weak and can lead to major errors. Today, with Federal Funds (FF) rate increases expected, investors and the Fed use “rules of thumb” for the relationship between the Federal Funds (FF) Rate and the 10-Year U.S. Treasury (10UST) bond yield. An example from the Fed is that it takes 75 basis points (bps, 1%=100 bps) of Federal Funds rate cut to get a 25-bps reduction in the 10UST. But, there’s a problem. The FF-to-10UST relationship hasn’t held well. To avoid risk, be mindful of misleading “rules of thumb.” Instead, focus on the enduring structural trends. For portfolio design, combine those trends with business model-based investing to achieve your objectives more safely. Business model-based investing is a style of fundamental investing that focuses on the health of a company’s business model with measures such as sales and cash. If you have time and energy for more frequent analysis, add momentum trading. Relationship of the FF rate to the 10UST yield. More straightforward. The chart below shows the second approach. Each point on the chart is a monthly pair of FF rate and 10UST yield. Below, zooming in on the past quarter-century, the relationship isn’t much tighter. It has also moved sideways. Seen in the twists and turns are the effects of credit and asset bubbles, fiscal and regulatory policy, and the global tech and trade transformation. 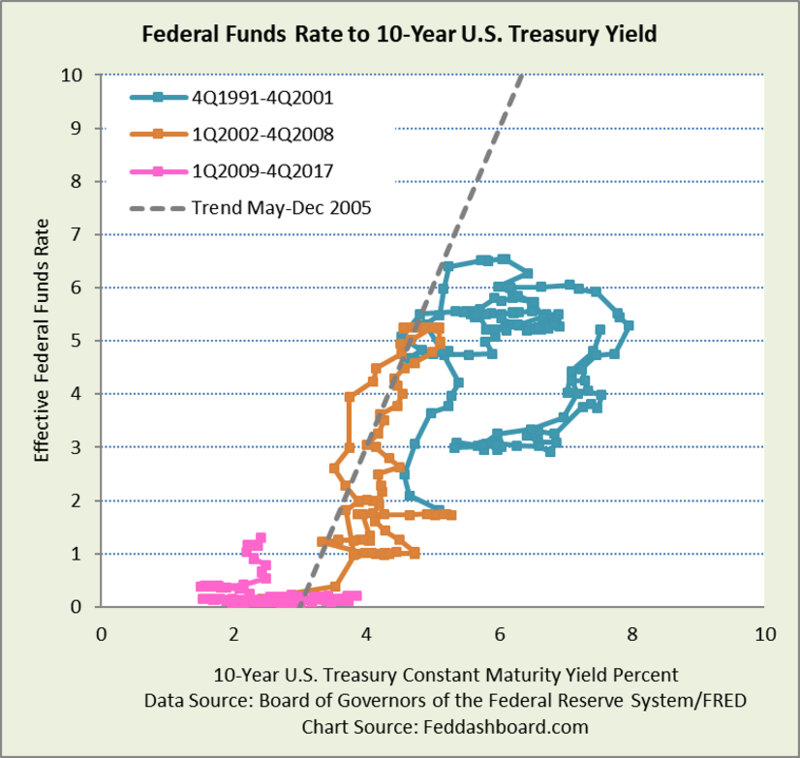 In 2005, the rate and yield were moving up, and the yield curve got flatter. 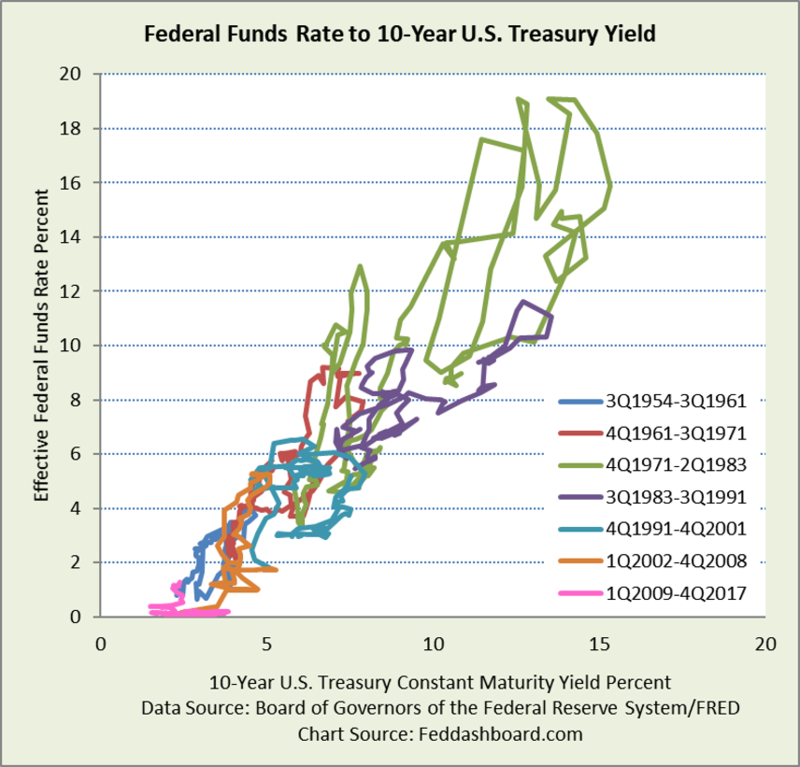 In 2001 and 2007-8, the rate and yield were moving down, and the yield curve got steeper. The value of the plots above is that they starkly show what is obscured in gentler yield curve comparisons. 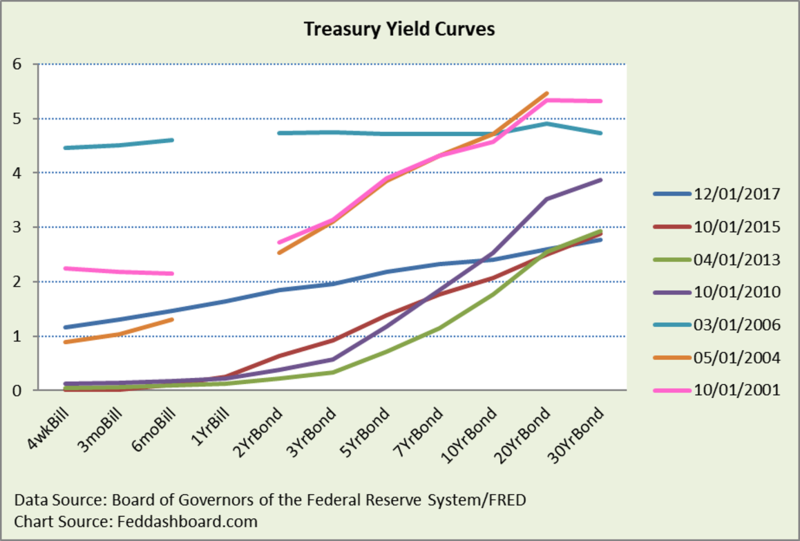 Picking interesting dates in the past 17 years, below are U.S. Treasury yield curves. Breaks in a yield curve are because a maturity wasn’t available/reported by the Fed in that month. Notice the errors in past expected yields – how far they were from today’s actuals, even as recently as 2015. Each period had its story. Understanding those stories and what is new today improves forecasts.